Measuring Success – EPC Recommendations Explained. 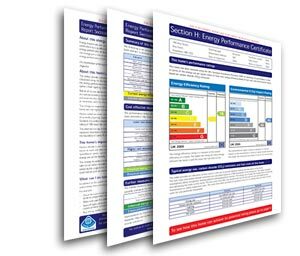 If you have seen a full Energy Performance Certificate (EPC) report you will know that there is more to it than just the multi coloured graph that you see on estate agent’s details. There is a report of several pages detailing more specific information such as the estimated energy use of the building, a summary of the building’s energy performance measures and energy saving advice. However, it is the recommendations section that provides the most pertinent information for the property and is the section that makes up the potential column on the ratings graph. This is the heart and soul of the EPC, but how does it work? Very simply the recommendations are based on the data collected about the building during the actual assessment and the results of the EPC Calculation. The final ‘current’ rating column is the efficiency of the building at the moment. The ‘potential’ column is where that building could be if the recommendations were implemented. The recommendations are based on what is pertinent to that building, so for a start, if the building has solid stone walls then cavity wall insulation won’t be in the recommendations list. The assessment identifies what measures have been done to that and what could potentially be done to that building from within a list of accepted green energy efficiency measures that are generally available to everyone. These are reckoned to be those measures which would cost less than £500 to implement in the property. Because these measures are considered low cost and accessible to everyone these form the basis of the potential column. If there is a difference on an EPC rating graph between the current and potential column there are likely to be some low cost measures that haven’t been implemented. Lower cost measures tend to include low energy lighting, cavity wall insulation and loft insulation. It should be noticed that many of the lowest cost measures are actually the most efficient and beneficial for the property. These are those that are reckoned to be over £500 and very energy efficient. These measures don’t form part of the ‘potential column’ in the EPC rating graph, but if these measures are implemented then the current rating of the building will improve in line with the efficiency increase for the building. Typically these measures are things like boiler changes or upgrades to boiler controls. These are those measures which tend to be most expensive and have a much longer payback period. They will increase your energy efficiency and help to cut the bills, but they are much more expensive to install and may require additional planning permission or works to install. They are not always options that are open to everyone. Once again these measures don’t form part of the potential column in a ratings graph, but if they are present or implemented then it will improve the overall rating of the building. The EPC Recommendations section will also give an indication as to how much each measure could save that property on an annual basis as well as the change in the ratings graph it could give. This whole section of the EPC gives excellent information on improvements to the property and potential savings that could be made. If you have an EPC on a property make sure that you use the information in it to save you money!